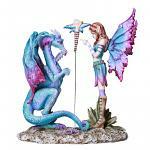 Beautiful statues ranging between 4" to over 2 feet tall! 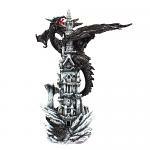 Our statues feature beautiful hand-painting and vibrant colors as well as detailed decpictions of dragon, elf, dragon, gargoyle, god, griffin, vampire, zombie themes and more. 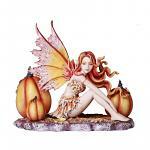 This bold and exquisite fairy statue is designed by Myka Jelina. This fairy dream is named "Crimson". The lavender-haired fairy sits on her toadstool as her flying frog prince comes to entertain her. With a woodland corset of green, leafy arm bracers, leaf slippers and a flowing skirt of pink she finds herself at home in the forest. Her bright-pink butterfly wings are wide open for balance as she reaches out for her frog prince. 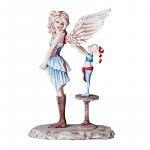 A whimsical and charming statue this is the perfect decoration for fairy-lovers and fairytale lovers alike. 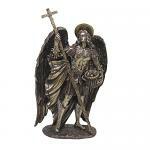 This statue is vividly painted in fine detail to be a true treasure of your home. A sweet depiction of a curly, blond-haired angel standing with great anticipation as a Christmas elf attaches her newly-earned wings. The angel is stylishly dressed in knee-high leather boots, an ice-blue gown that flutters when she walks, and a red lace corset. The elf, too little to reach on his own, stands on a plant stand, dressed in a striped cap, red sash around the waist, and light-blue stockings. Linda Ravenscroft and Nemesis Now present the Fairy Flower Collection. 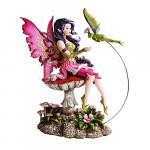 This fantastic range of fantasy butterfly winged fairies sitting on beautiful flowers. Each fairy has a unique meaning behind it. On her knees and in full glory she gives thanks in worship. 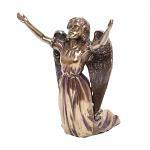 This darling angel figurine inspires you to rejoice in your spiritual journey. 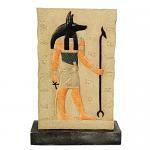 Celebrate the power of Anubis with this plaque standing on your altar. Whether you worship or are an Egyptian enthusiast this decoration is a charming addition to your altar space. The Archangel Gabriel is known as the messenger of God and is among the most favored of the angels. He stands in striking power through this detailed-crafted statue. As a warrior he is legendary and feared as much as he is respected. He is depicted as a powerful warrior in this statue. 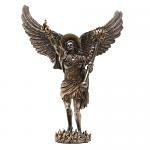 Archangel Michael rises victorious in the war between heaven & earth. He defeats the dragon and soars to the glory of victory and honor. The glory of angels comes to life in this stunning & detailed homage to Saint Barachiel. 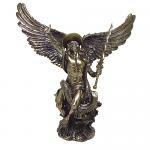 One of the seven archangels and known as the angel of blessings you will find his statue to be a celestial treasure in your home. 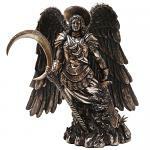 The Archangel Uriel stands with the morning star clutched in his stand. He stands atop a pool of flames as he stands in the glory of God. 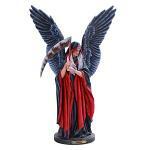 Known as the angel of repentance this statue is a great addition to anyone's altar. 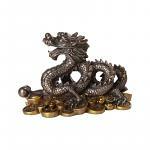 This money dragon attracts wealth and prosperity to the home where it stands. The expressive, serpent-like dragon sits on top of coins and coils around the wealth it has gathered. A common decoration in many homes, the Chinese dragon is a long-celebrated symbol of power and wealth. Her gown is impeccable with it's shimmering gold and green with a rich design, her metal armor bejeweled and attached to a necklace fit for a queen. Her plunging necklace bears just the right amount of skin to make her suitors weep, and her feisty, green dragon companion clutches her arm bracer. This mysterious beauty is a conversation piece for the dragon lover and the Medieval lovers alike. Taking a moment to enjoy the beauty of the Fall harvest, the pumpkin fairy leans against her giant pumpkins and takes a moment to enjoy the view. Brightly colored and dressed in fine detail, with her curly hair blowing in the wind, this gorgeous fairy statue is perfect for any home and any fairy lover. Finely detailed with the Aztec warriors and gods, this skull depicts much of the well-known and well-beloved art of the ancient Aztec civilization. 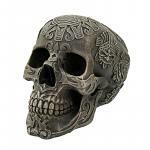 Perfect for those who practice ancient magic or for those who love the ancient legends of history, this skull is a welcome and finely decorative accent to your altar space or home. This beautiful dragon LED statue features a brightly-colored, baby dragon sitting on top of a giant, fractured egg. He roars as he comes to life in the glaring sunlight of his birth day. Vibrant in colors of teal, purple and gold, the baby dragon shrieks as he looks for his mother. 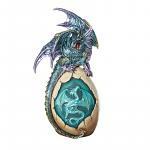 The front of his egg features a gorgeous dragon medallion which changes color when the light is activated. 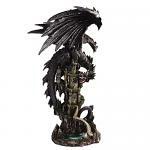 This dragon statue brings you tremendous support and connection to your dragon passions. 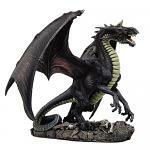 Any dragon lover will enjoy this statue as part of their decoration. Vividly colored with blue, purple, teal and green, the dragon is exquisitely detailed with a pensive & sad expression, lowered head, and long, curled tail. 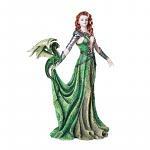 The stylishly dressed fairy stands with her finger pointed at the dragon, issuing a soft & stern warning. This statue is certainly a conversation piece and something that will make you smile every time you see it. The roar of the black dragon cuts through the brisk night air like a blade. His screech can be heard for miles as he claims his victory upon the castle spire. The black dragon prowls the landscape. A predator to be feared his roar can weaken the most courageous knight and send woodland creatures scattering for shelter. Wings unfurled, snorting breaths of air, fangs dripping with intense focus, all her greatest possessions lay within these walls... the black dragon guards her treasure with her life and waits with poisonous flare to defend all she holds dear. A human is but a mere snack to this formidable giant whose flesh-tearing talons have taken hold within the stone of the castle walls.